Fresh off the grill! 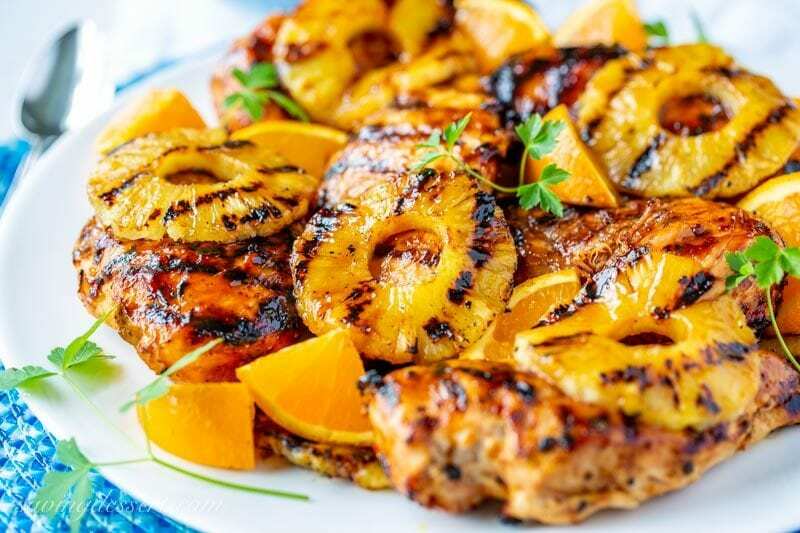 This Orange Barbecue Grilled Chicken Recipe is deliciously different and a breeze to throw together in a flash. We love the bright orange flavor and the hint of ginger and pineapple juice in the sauce. It’s lip smacking good! I hope you had a chance to gather with family and friends this weekend and put something delicious on the grill. In the United States we celebrate Memorial Day to honor those who have died while serving our country in the armed forces. While this holiday has grown into a time to celebrate the beginning of summer or the end of the school year, let us not ever forget the parents, siblings, husbands and wives who miss their loved ones. Let’s talk about this wonderful chicken! This is not your plain old barbecue grilled chicken. The orange flavor is front and center and the sweet grilled pineapple adds that something special to make this meal a real treat. The sauce starts with your favorite BBQ sauce – bottled or homemade – whatever you prefer. 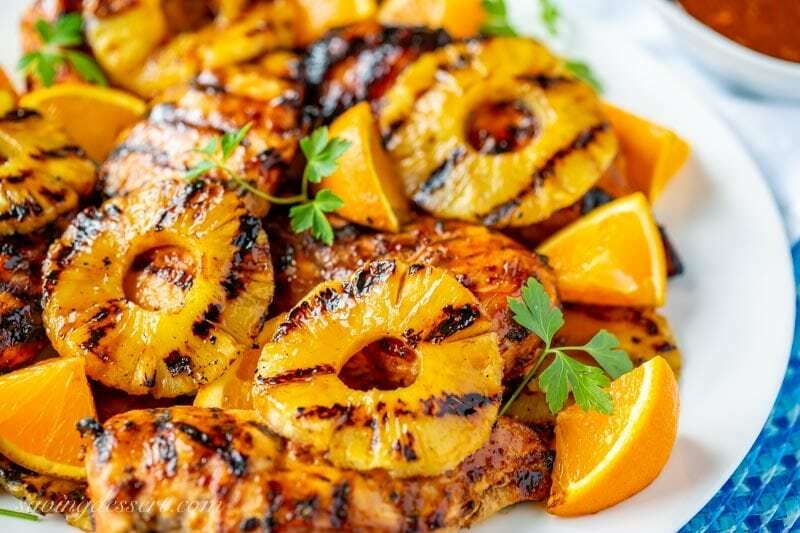 Add unsweetened pineapple juice, grated ginger, and orange zest, and it transforms into a delicious sauce perfect for the grilled chicken and pineapple. You’ll want to hang onto this recipe for your next gathering around the grill! Let’s be grilling friends! If you try our recipe, please leave a comment, and photo if you have one, on Pinterest. If you share on INSTAGRAM use the hashtag #savingroomfordessert so we can stop by and give your post some love. And we’d be so happy if you would FOLLOW Saving Room for Dessert on FACEBOOK | INSTAGRAM| PINTEREST | TWITTER for all the latest recipes and updates. Here are a few more grilled recipes you might enjoy! 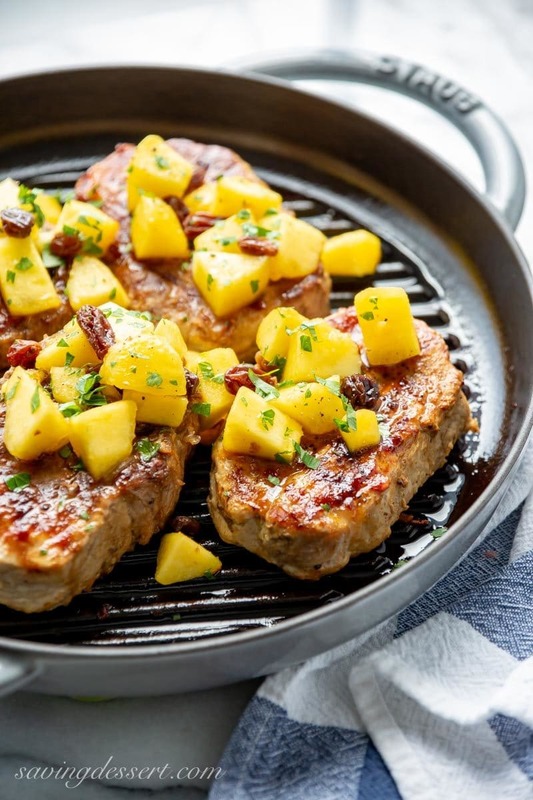 Grilled Pork Chops with Peach Agrodolce is an easy and delicious main course quick enough for weeknights, and sophisticated enough for special occasions. 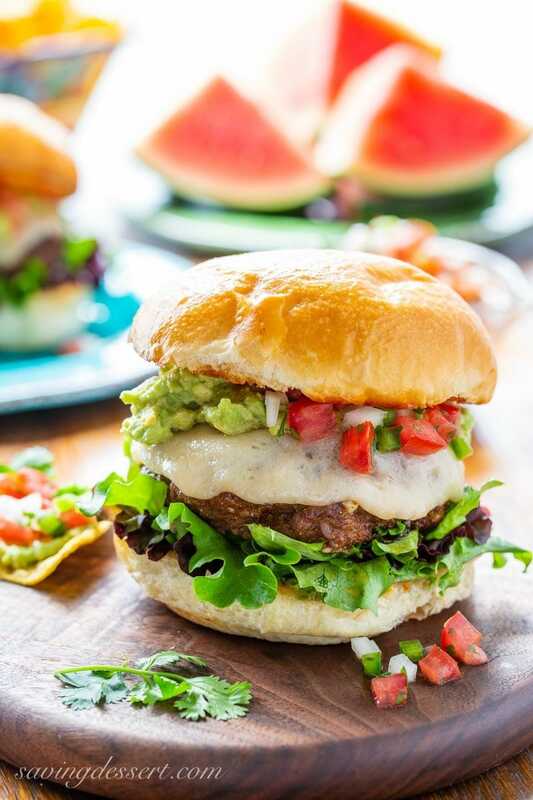 Cheesy Grilled Taco Burgers – all the authentic Mexican flavors you love, in one tasty burger! 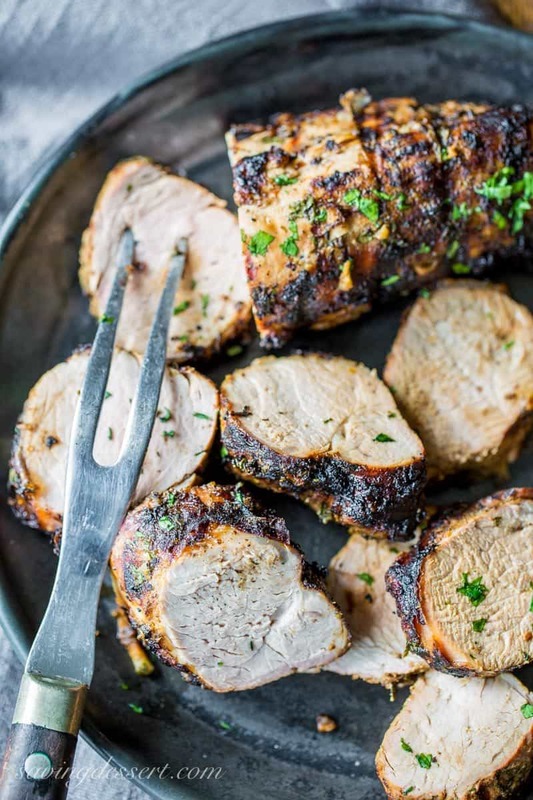 Grilled Cuban Mojo-Marinated Pork Tenderloin ~ an easy and delicious overnight marinade with powerful flavors from the garlic, citrus and herbs. Grilled to perfection, this tender pork will garner praise from your grateful dinner companions. Deliciously different and a breeze to throw together in a flash - you'll love the bright orange flavor and the hint of ginger and pineapple juice in the sauce. Lip smacking good! Stir together the barbecue sauce, orange zest, grated ginger, 1/2 cup of the reserved pineapple juice and brown sugar if using. Set aside half the sauce for serving with the chicken. Dip folded paper towels in cooking oil. Use tongs to hold the folded oiled paper towels to clean and oil the grill. Set the towels aside to use again before grilling the pineapple. Preheat grill to 350 - 400F. Sear the chicken breasts over a hot grill, basting with half the barbecue sauce. Cook until the juices are clear and the breasts are cooked through, about 8 to 10 minutes on each side. Oil the grate of the grill with the paper towels dipped in vegetable oil. Grill the pineapple slices until lightly charred. Serve the chicken with a slice or two of pineapple. Pass the remaining barbecue sauce when serving. I can never get enough grilled chicken recipes! This Grilled Chicken with Balsamic Vinegar from Kalyn’s Kitchen is going on our menu soon. Love this Southwestern Grilled Chicken with Lime Butter recipe from She Wears Many Hats – it looks super juicy 😉 Around here we could eat these Grilled Chicken Nachos at least once a week. Check out this delicious recipe from Taste and Tell. Summer time is perfect for easy meals on the grill. Since I still don’t have a real kitchen, I’m grateful we can at least grill our dinner! This renovation has been a stressful undertaking with problems at every turn. Maybe one day I’ll share some before and after photos and tips on what we’ve learned … so far. And, on a much happier note, we’re on baby watch again! Our daughter Allie is expecting a little girl in a few days so this means our grandson Isaac (4 years old) will have a sister named Isabelle! We’re so excited for them all. Our son and daughter-in-law welcomed their first child, a little girl named Jayden, only 2 months ago. These girl cousins will get to grow up together – and we are feeling very blessed! That definitely looks delicious! Thanks for the shout-out for my Grilled Chicken with Balsamic Vinegar. You can never have too many grilled chicken recipes, right? I agree Kalyn – thanks so much! We enjoyed every bite of this! It’s a keeper. Thanks for sharing the recipe. Thank you so much Deb! We love feedback and appreciate you reading the blog and trying the recipes. Please let me know if you have any questions. Thanks again! Don’t know how I missed this one! I’ll blame it on the craziness of the holiday weekend 🙂 What a wonderful grilled chicken recipe, Tricia. The BBQ and citrus must taste wonderful together. Pinning! Thank you so much Susan! Have a happy weekend and hope you get a chance to make this recipe – it’s a keeper! This recipe is the one for me! Love it with that good chicken and luscious pineapple. It looks heavenly and is a must try! How great with the babies, lucky you!!! Thank you so much Pam! Hope you are having a great start to a wonderful summer. I love pineapple and ginger, what a great way to give some flavor to a chicken breast. I am going to tell my husband to grill this for us. Have a wonderful week. Thank you Gerlinde – hope you enjoy this recipe! Exciting news about Isabelle! 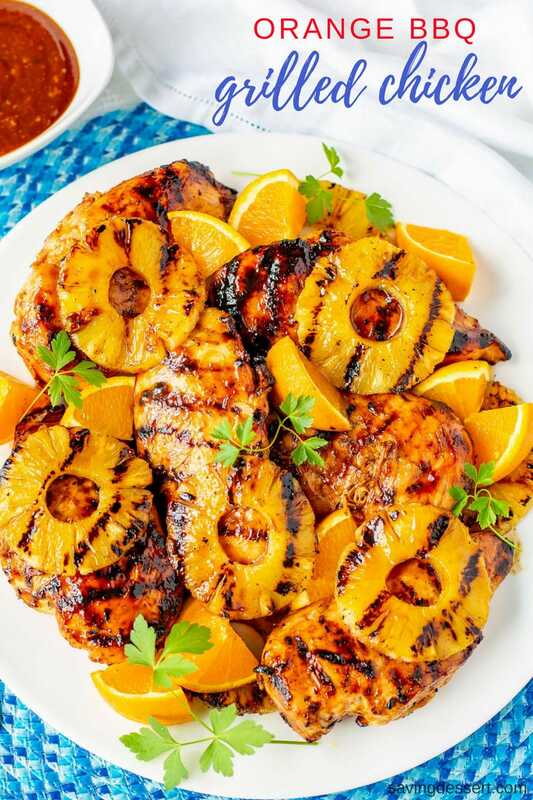 And exciting recipe — love orange and chicken, and adding pineapple to the mix is a nice touch. Wonderful pictures, super dish — thanks. Thank you John! We are so excited – mostly about the new granddaughter but the recipe is great too – haha – have a lovely week! Those grandchildren will be QUITE HAPPY Tricia, if they get to eat your foods! 😉 You will SPOIL THEM ROTTEN!!! CONGRATULATIONS on ANOTHER GRAND BABY!!! I can’t wait to cook for them – my grandson loves to eat and loves to look at my blog which is so much fun. Have a great week and thanks for stopping by! So much going on in your life! This looks like a great dish and how you are finding time to keep cooking is beyond me! Much happiness! We haven’t been able to do much cooking Abbe – that’s why this was so great – easy and delicious and the cleanup is a breeze! This is gorgeous Tricia. Maybe you should be without a kitchen more frequently if you come up with beautiful, delicious dishes like this (just kidding). So exciting about another new baby, you will definitely have a busy but fun summer! I need more grilling recipes in my life Chris – so that’s a great attitude to have in this situation. What can we do but adapt. Another new baby – trying to catch up with you! I will make this this summer..cause I love BBQ sauce and ginger and chicken too..
We love to freeze fresh pineapple and add a piece or two to a smoothie – it adds that little something sweet 🙂 I don’t know if my daughter is going to go for Bella as a nickname but I’m already thinking of Izzy 🙂 Have a great week! I am just in love with that colour!! Great food and great photos, Tricia. Oh, that sweet stickiness has got to be divine, Tricia. We did get a chance to start up the grill this weekend and I’m grateful for the luxury of sitting down with my family to a meal in the comfort of home, too. I’m always looking for good ideas for grilling! This is easy and packs such a great flavor punch. Love it! And good luck with the renovation and so exciting about the baby’s upcoming arrival!! I love the time with family – especially at home. We are very excited about another granddaughter – I’m sure pictures will be involved! I need to taste this recipe, Tricia. I love the combination of flavors and anything this beautiful that is quick and easy as well is a big winner in my house. This is a home run! Quick and easy and delicious – this recipe has it all Robyn – hope you give it a try. Thanks for stopping by! This looks so delicious, I was just thinking that I needed to start collecting grilling recipes that the kids would approve of and this is definitely going on the list! You are such a good mom Sara – I think they will love it! Thank you so much Sue! I will probably share a photo or two – haha! Have a great week! Thank you Jennifer – this is a great combination and an easy recipe. We had a lovely long weekend and took care of a bunch of things on our list. Have a wonderful week!